Tradition says there are three ways to grow a company's revenue: fire up the sales team with empty promises, cut costs and downsize, or cook the books. But what if there's a better way -- a way that nine amazingly profitable and well-run companies are already embracing. Jason Jennings and his research team screened more than 100,000 American companies to find nine that rarely end up on magazine covers, yet have increased revenues and profits by 10 percent or more for ten consecutive years. Then they interviewed the leaders, workers and customers of these quiet superstars to find the secrets of their astoundingly consistent and profitable growth. Jennings discovered that consistent high performance takes more than locker-room speeches to the sales team. What these companies have in common is a culture based on a shockingly simple precept: Think big, but act small. It works for retailers like PETCO and Cabela's, manufactures like Medline Industries, service companies like Sonic Drive-In, private educational companies like Strayer, and industrial giants like Koch Enterprises. 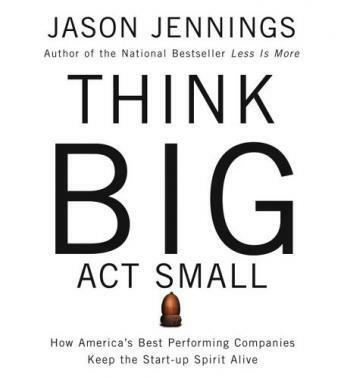 In Think Big, Act Small, Jennings reveals the unique power of combining the strengths of a big organization with the hunger of a start-up. Any company, no matter what its size or industry, can benefit from following these examples. This is an excellent book! You would be suprised at which companies have been profitable consecutively for the last 10 years. It's a great reminder for leaders of any company what is important in business.